The Redskins kicked off their second year of training camp in Richmond on Thursday morning during what started out as very a rainy practice. Enjoy some photos of the first training camp practice of 2014. 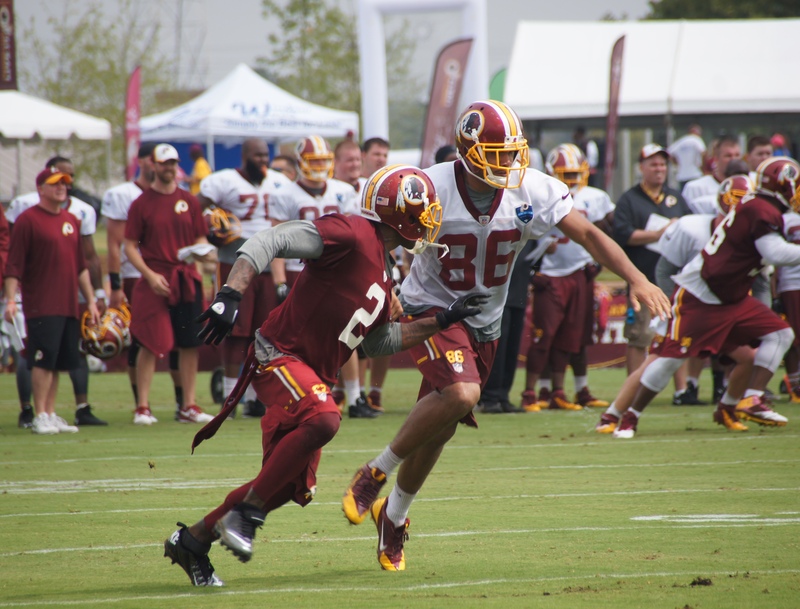 DeAngelo Hall goes against tight end Jordan Reed. Wide receivers DeSean Jackson and Santana Moss. Cornerback DeAngelo Hall tries out his television skills. Redskins offensive linemen take part in drills. Rookie linebacker Trent Murphy greets fans after practice. Running back Chris Thompson makes a cut on a return. Running back Chris Thompson heads upfield on a return. DeAngelo Hall and safety Ryan Clark communicate with fans. DeSean Jackson attempts to make a diving grab. Linebacker Brian Orakpo takes a drink. Running back Roy Helu, Jr. looks for a hole in the defense. Linebacker Adam Hayward prepares for a drill. Ryan Clark points to the crowd. Clifton Geathers walks with some young fans after practice.